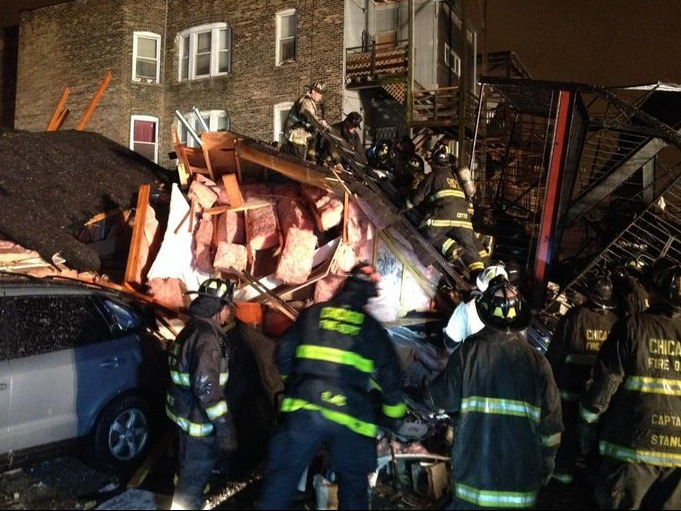 About 100 fire personnel are desperately searching through the rubble for victims after a building collapsed in Chicago. Search-and-rescue crews pulled two residents from the rubble of the apartment building on Sunday night and were searching for more people, fire officials said. The two people rescued were taken to a hospital in unknown condition. Lyle said the call about the building in the Washington Park neighbourhood on the city’s Southside came in about 7 p.m. local time, initially as a possible explosion at the site. Officials do not know if an explosion actually happened or if the initial caller was hearing the sounds of the building coming down, he said. Both victims were rescued about 20 minutes after fire crews arrived on the scene, and the building was “completely down,” according to the department’s official Twitter feed. A Chicago police spokesman said officers were assisting on the scene, but he declined to provide more details.